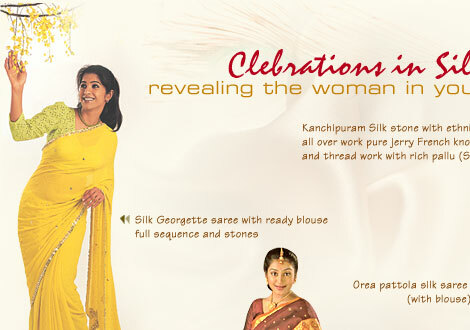 The Indian Saree boasts of oldest existence in the sartorial world. It is more than 5000 years old! It is mentioned in Vedas, the oldest existing literature (3000 B.C.) Patterns of dress change throughout the world now and then but, the Sari has survived because it is the main wear of rural India. 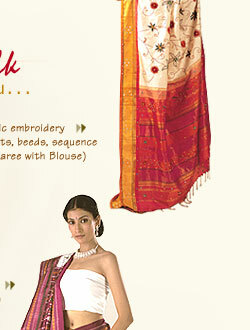 75% of the population wear versatile sari. We can certainly call this cloth versatile because it could be worn as shorts, trousers, flowing gown-like or convenient skirt-wise--all without a single stitch! Parthas has carefully planned the display of enchanting textiles, supported by spacious sales counters to make your shopping experience even more comfortable and enjoyable.